So you’ve arranged the perfect dinner date at your place. That is great news! Now what? Looking for some pointers on what to make and how to have fun in the kitchen? We’ve got you covered! 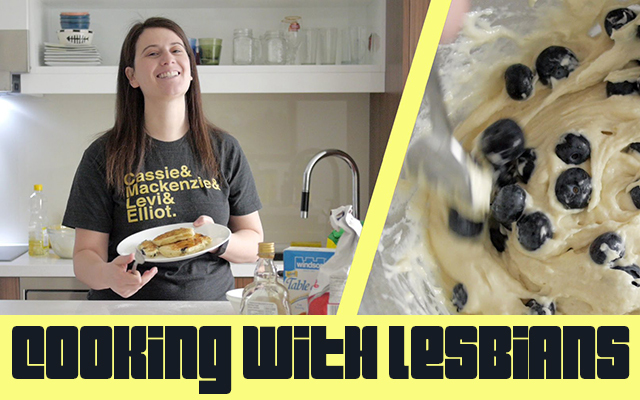 Have you seen Cooking With Lesbians? An informative and funny lesbian cooking show is put on by the lovely ladies of the UnsolicitedProject over on YouTube. Although Adrianna doesn’t offer measurements for the recipes, the episodes are very funny. From her use of profanity and her mad skills in the kitchen, I could watch this show all day! I seem to identify more with Adrianna DiLonardo, because like her, I tend to fumble around the kitchen a lot and I feel like I can relate to her struggles. Dropping the can lid into the pasta sauce and breaking the packages are eerily familiar situations to ones I’ve been in. There are a few interesting ideas featured from Lesbian Turkey Tacos, Let’s Get Laid Bolognese, to Sloppy Seconds I can say it is a great show! Check out some of my favorite episodes here. This entry was posted in Fun Stuff and tagged Adrianna DiLonardo, Cooking With Lesbians, Lesbians, lgbt, UnsolicitedProject by Janey Grace. Bookmark the permalink.